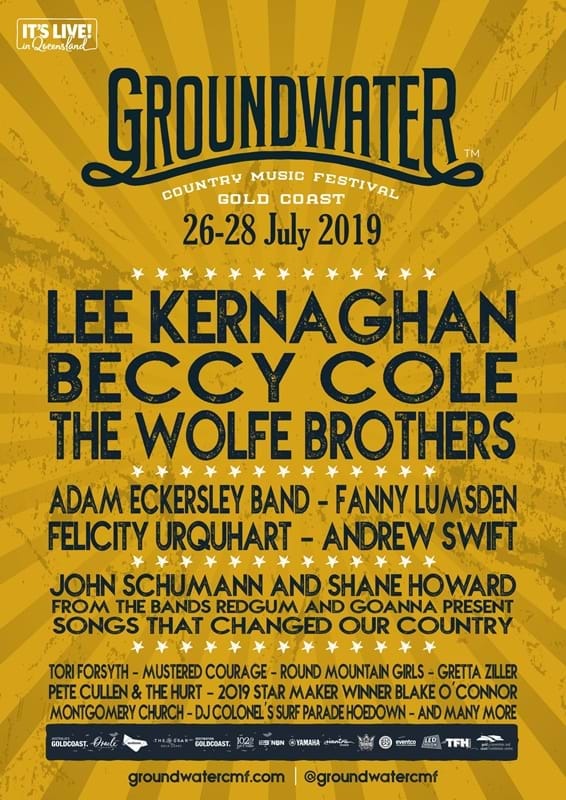 Groundwater Country Music Festival is returning for its 7th year with a bumper line-up including reigning King and Queen of Australian Country Music Lee Kernaghan and Beccy Cole and the big winners at the 2019 Golden Guitars, The Wolfe Brothers plus the cream of the crop of the Australian country music scene. Gold Coast local Lee Kernaghan has been awarded 36 Golden Guitars, is a four-time ARIA winner, and was presented with the ARIA for Outstanding Achievement in 2015. While he has never performed at Groundwater before, he got up on stage with James Blundell last year as a guest to close out the festival and announce that he would be back this year. This FREE festival will be held July 26-28 in Broadbeach on the stunning Gold Coast through its bars, restaurants, streets and parks. There will be more than 110 incredible live music performances with over 130 hours of free live entertainment. The first artists announced for the festival include, Lee Kernaghan, Beccy Cole, The Wolfe Brothers, Adam Eckersley Band, Fanny Lumsden - want more? Watch below and find out who else is going to be rocking country on the Gold Coast. It's the place to be in July!